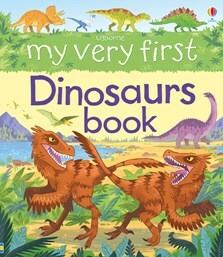 Click on a topic box to visit the recommended websites or to hear how to say the names of the dinosaurs and other prehistoric animals in this book. Names with a * are animals that lived at the same time as dinosaurs. They hunt! They eat! They fight! This charmingly illustrated book is a perfect way for little children to find out about dinosaurs and other prehistoric creatures, from the horned Triceratops and huge Brachiosaurus to the fearsome Tyrannosaurus rex. With lots to spot and talk about, from how big and small dinosaurs were, to where they came from.